For every Shorewatch a data sheet should be filled in (regardless of whether cetaceans are sighted). 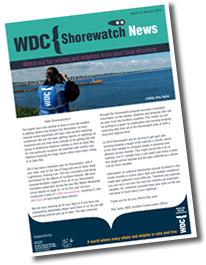 A different data sheet should be used for each different Shorewatch site but multiple observers may be listed on a single data sheet. 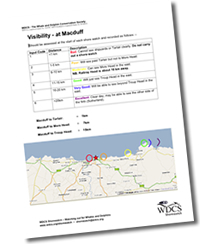 The front of the data sheet (effort data) should be filled in on every watch; this will include the time of your watch, environmental conditions and whether you did or did not see cetaceans. Use a new row for each 10-minute Shorewatch. Each data sheet has 11 rows; enough space to record 11 shorewatches. Shorewatch Observer – fill in your name & initials in the first open row in the Shorewatch Effort table. Set the interval timer to beep every minute, note the start time and get watching! Cetaceans Present? – did you see any cetaceans during the 10-minute watch? Yes (Y) or No (N). Note: If cetaceans were seen you will need to fill in additional information about the sighting on the back of the data sheet. Number & type of boats– after the watch count the number of boats seen and note the type of each using the WDC Shorewatch Boat Key. No. of people talked to – did anyone ask what you’re doing? Did you talk to anyone about Shorewatch? Whales and dolphins? Record the number of people you interacted with during the Shorewatch.